safe running/hiking experience for participants in this event. Ha! There's my permission to WALK the whole 50K race if I decide that's the best way to preserve my injured hamstring. The signs clearly mention "hiking" not once, but twice. Hopefully, I'll be able to run some and not have to walk the whole thing. Yeah, I can use "time on my feet" for ATY training but I really don't want to take ten or eleven hours to finish the 50K (11:15 hours are allowed). At the other extreme, I'm not looking for a 50K PR either. That won't happen again in this lifetime. 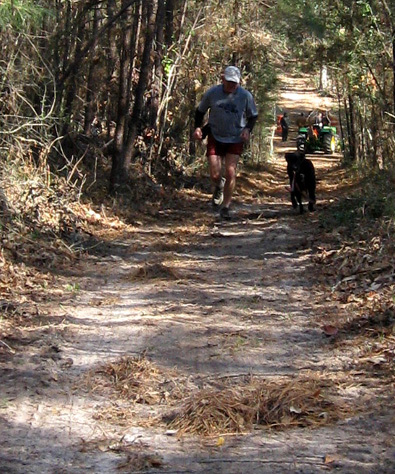 My PR is 4:50:40, set ten years ago at the Aiken 50K. I'm not sure I could run a 9:10 pace for a 5K right now! 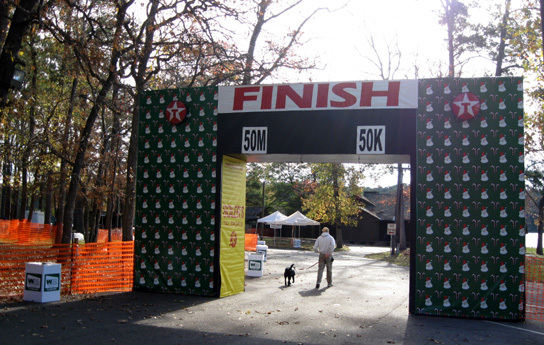 I'm glad I ran the 50-miler at Sunmart in 1998 and not the 50K. It's a bit frustrating to return to a race you've run before and not do as well the second time -- even a decade later, when your expectations may not be as high. Jim and I both ran the 50-miler that year and finished within a few minutes of each other. Our times of 9:46 (Jim) and 9:53 (me) put us squarely in the middle of the pack. That race was a nice accomplishment for both of us (it is still Jim's 50-mile PR) and we have fond memories of it -- even though we hadn't met each other yet. By the next December we were a couple and we wanted to go back to Sunmart together. I had recently finished my first 100-miler at Arkansas Traveler and decided 50K was my limit while still recovering from the longest distance I'd ever run. Jim entered the 50-miler again. 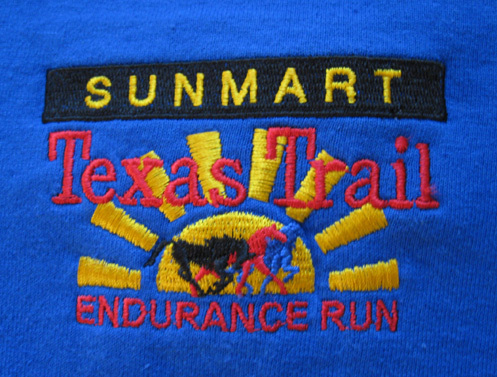 I ended up withdrawing before the 1999 race because of an overuse injury; the 50-miler in 1998 was my only run at Sunmart before this year. Jim dropped down to the 50K in 1999 because he wasn't as well trained as he wanted to be for the longer race. He finished in 5:38, about an hour longer than his PR for the distance but still placing respectably in the top 38% overall. Since I couldn't run, I had fun helping RD Norm Klein (of Western States RD fame) and his wife Helen at the finish area and crewed for Jim there when he came through on each loop. We've just never gotten back to Sunmart until now, mostly because in the intervening years we were running more mountainous race courses. Bad knees, the new reality that I can no longer run mountainous courses, proper timing and location for our goal race (ATY), and my search for races with more generous time limits finally brought us back to Sunmart this year. One of the biggest changes at Sunmart occurred after the 1999 race, the last year for Norm Klein to direct the race. The race continues to be generously sponsored by Sunmart and Petroleum Wholesale, which is a Chevron, Texaco, Exxon/Mobile, and Conoco chain of convenience/fuel centers located in ten states throughout the Southwest. The current race director is Roger Soler, who owns the Soler's Sports chain of stores in San Antonio. Because the race is so large (there have been about 800 runners and numerous volunteers at least since we ran the race ten years ago), Roger heads up a professional event management team to pull off a smooth, safe, enjoyable event. It was very interesting to watch all the race preparations from our perspective as runners who were camped out at the race venue for five days before the event. It appears to be a well-organized race. We arrived on the Monday before the race. 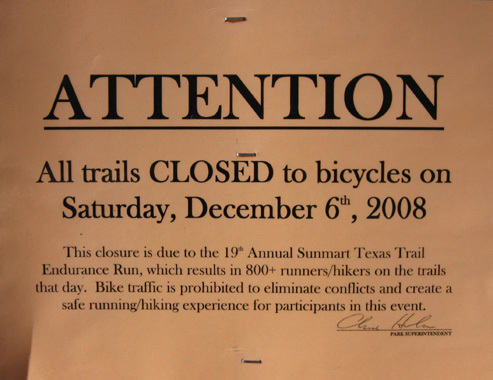 Signs like those at the top of the page were already posted at every trail head to warn unsuspecting visitors of the crowds that were coming. As mentioned in an earlier entry, we deliberately chose the campsite closest to the aid station located on the Prairie Branch Loop Trail so one or both of us could let Cody out of the camper a couple times during the race as we passed nearby. We were only about 200 feet down the trail from the aid station and even closer to the trail head in our cul de sac. That meant we could easily see what was going on with "our" aid station. 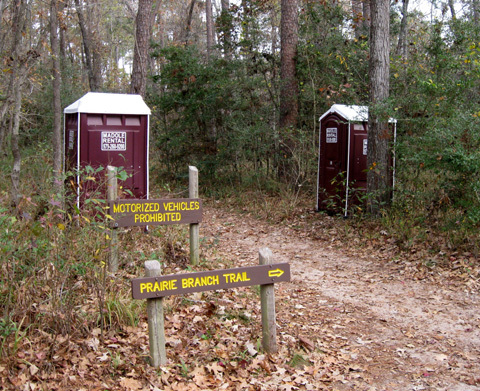 For example, on Tuesday two Porta-Potties were delivered to the trail head and left there for three days before someone realized they were supposed to be up the trail closer to the aid station. When we got back from running errands this morning, they'd been moved. While they were close to us they were very handy. We have electrical and water hook-ups, but not sewer. We're doing our best to take "Navy showers" and avoid filling up our black water tank before we leave next Monday; it's really inconvenient to have to move the camper to the dump station and then set everything back up. Being able to use those portable toilets a few times a day was great while they were clean. After they are used hundreds of times during the race, we'll be really glad they are no longer just a hundred feet from our door! Apparently all the aid stations at Sunmart will have two portable toilets. We ran by three aid stations on the course yesterday and the toilets were in place. They're pretty handy to have on a training run, too! Busy aid station the 50K runners will pass five times, the 50-milers ten times. I wondered why the toilets had been delivered so early. 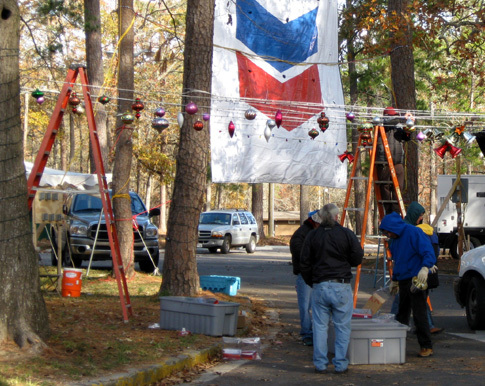 I quickly realized that such a major undertaking requires early set-up at the park -- much earlier than for the Rocky Raccoon races. It appears Roger Soler (RD) and crew have everything under control at the park. 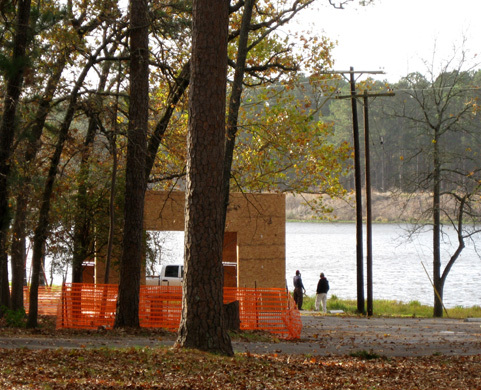 On Tuesday a work crew had already erected a large tent at the start/finish area. They were constructing the framework for a long "kitchen" to serve the post-race barbeque and building the wooden start/finish "archway" (it's not an arch but I don't know what else to call it). The course was also being marked Thursday as we ran, and one part of the 50K course on the Triple C Trail was being graded to remove leaves, branches, and pine cones from the trail. (we preferred running on the pine needles and leaves rather than sand). We went back through the start/finish area this morning to see how it was coming along. The large tent was full of tables and chairs for the pre-race breakfast and post-race barbeque dinner. The kitchen looked done; we were impressed with all the propane tanks behind it. 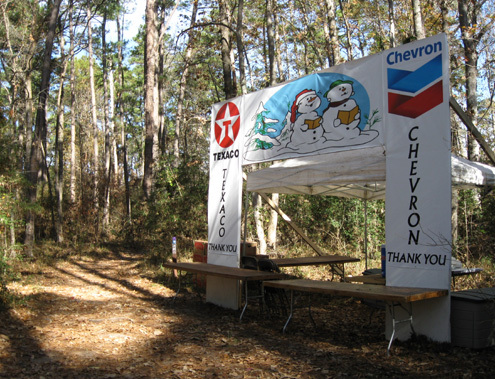 Several other tents and canopies were in place for the aid station, finishers' awards, overall and age group trophies, etc. One room in the lodge was full of medical supplies. I'll show more photos from the finish area today farther down in this entry to break up the text. 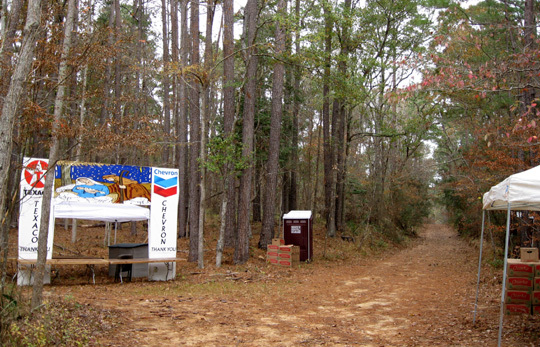 As busy as crews were all week at the park, I can imagine all the work that was going on forty miles south in Houston. Besides its scenic course, Sunmart is also well-loved for its delicious pre-race banquet at the Sheraton North Hotel and its generous goodie bags. 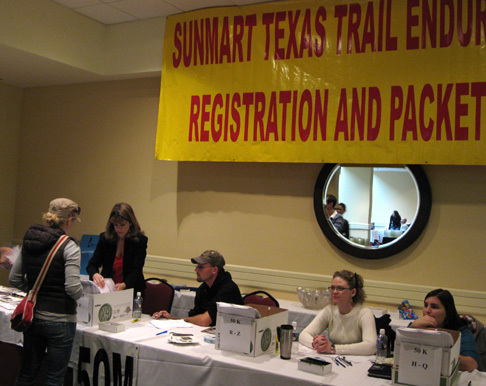 Packet pick-up was scheduled from 11 AM to 7 PM today. Runners or their approved designees must pick up their race numbers, timing chips, and schwag the day before the race, not on race morning. They can also enter the race as late as this evening or change from one race to another; those two features are somewhat unusual for ultras nowadays. We decided to arrive at the Sheraton about 3:30 PM to avoid rush hour (hour???) traffic and have time to socialize with friends we'd be seeing. We'd eat when the pasta buffet line opened at 4:30, socialize some more, stay for the pre-race briefing, and drive back to our camper after rush hour traffic had died down. That all went very well, except that rush "hour" traffic NEVER seems to die down in a huge metro area plagued by road construction on nearly every freeway. But I digress . . . Registration was handled promptly and efficiently. Many of the runners who were staying at the hotel or lived in town had already picked up their numbers and goodies. Jim was able to quickly change from the 50-mile race to the 50K. We got our timing chips in a nearby room; chips are great for everyone involved in large or complicated races. We also received a tiny ticket for a large selection of goodies. This part of the event hasn't changed a bit since we were here 9-10 years ago; Sunmart runners feel like kids at Christmas with all the "stuff" they receive and it's one of the promotional points they use to draw large numbers of runners..
Sunmart's sponsors are proud of their tradition of providing lots of "premiums." 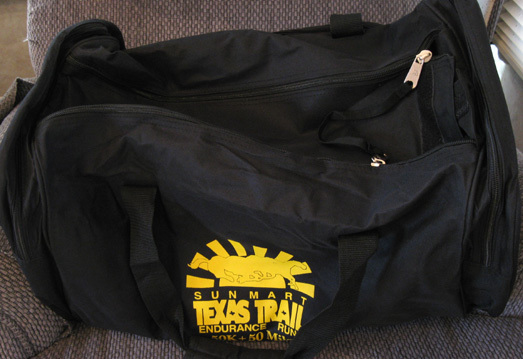 This year's large zippered, pocketed travel/duffel bag (shown above) is much nicer than the bags we got at Sunmart nine years ago and twice as large as the bags distributed at Leadville. As in other races where the goodie bags aren't already filled, runners go down the line and choose the items they want. We each selected a technical long-sleeved running shirt (black or gold, our choice), a short-sleeved mesh polo shirt (blue or gold), hat in various colors with the Sunmart horse logo, mesh backpack, day planner, work gloves, Hammergel, nail kit, and the 18-page magazine-like 2008 Program full of race history and stats, the names of the 2008 entrants, and 2007 finish times. There were several non-running related items we didn't want. Also included in the entry fee are the finisher's medals and jackets (more about those after the race), the traditional solid bronze stallion awards for overall and age group winners (which can cause problems to overall winners who have to fly home because they are so large and heavy! ), the pre-race pasta dinner on Friday night and breakfast early Saturday morning, the post-race feast, aid station food for up to 12 hours, potties in the woods, and all the volunteers' support during the race. Jim and Cody walk by the aid station at the start/finish/turn-around the day before the race. I think all that is worth the $80 entry fee for either race ($90 after a certain date) even though we've never been fast enough to win one of the horse awards. Sunmart attracts runners from around the world. The race is often the International Association of Ultrarunners (IAU) Trail World Challenge. Runners from international federations compete with the open field for the championship. Overall and age-group times are always fast -- even in the older age groups. The overall 50-mile course records are 5:20 (men) and 6:14 (women); Ann Trason's record time has stood since 1994. 50K course records are 3:07 (men) and 3:35 (women). One of the best things about Sunmart is that the slowest runners are treated every bit as graciously and enthusiastically by race management and volunteers as the elite runners. Even walkers get respect. After we picked up our numbers and goodies we talked with a runner we know from Leadville, CO (Don Adolph), looked over the goods offered for sale by Soler's Sports and other vendors, and waited for the buffet line to open. We were near the front of one of the four efficient lines so the food was piping hot and fresh. There were several kinds of vegetarian and meat pasta, salad items, hot vegetables, rolls, beverages, and a large selection of desserts. We shared a table with Sylvie Boisvert, an invited runner from Quebec City, Canada, and Wynn Davis from Wisconsin. We knew Wynn's name from his posts to the internet ultra list but hadn't met him before. It was good to meet both runners. During dinner we also met Deborah Sexton, a vivacious Texan who is also on the list, and talked with old friends Winston Davis from Georgia and married couple Larry Hall and Beth Simpson, who live in the upper Midwest. We thought we'd see another Georgia friend, Tom Adair, but there were too many people at the banquet to find him. Entrants weren't listed on either the Sunmart or Robert Soler's web sites so we didn't know who would be coming until we got the 2008 Program. As we scanned the names in both races, we realized we didn't know very many of the 800+ entrants! That seemed unusual because we usually know many of the runners at races from one end of the country to the other. Then we realized we've been "running in different circles" (so to speak) than the majority of folks who run this race. 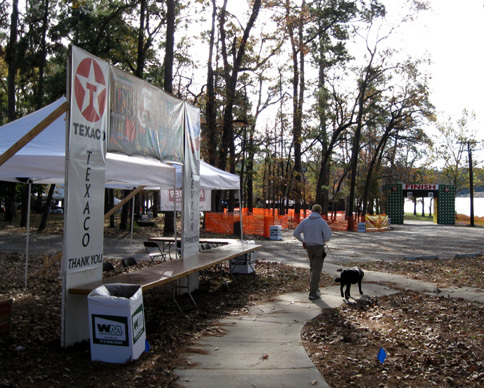 Many of the entrants are from Texas and don't go around the country to run ultras and/or do mostly marathons and 50Ks. Until recently, Jim and I have been mostly focusing on mountainous 100-milers in the Rockies. When we go to 100-milers, whether tougher ones like Hardrock or Leadville, or "easier" ones like Umstead or Rocky Raccoon, we know many of the other runners. Going to Sunmart allowed us to make some new friends, which is always fun. Crews work Friday to get the start/finish area ready for the onslaught of runners. Since there was enough table space in the large dining room for everyone to have a seat, we hung out until the pre-race briefing at 6:30. We left before the featured speaker so we could get a good night's sleep back at Huntsville State Park. The drive that took us less than an hour in the afternoon took almost two hours at 7 PM. It probably would have been worse if we'd left the Sheraton earlier. Oh, well. 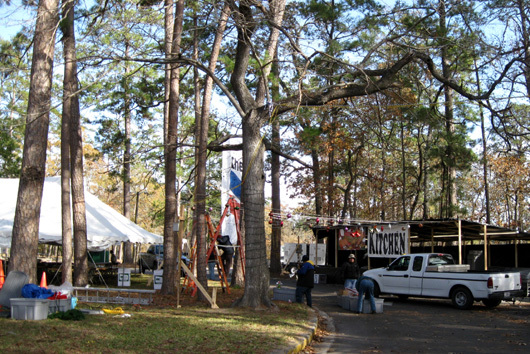 The huge advantage of camping 2/3 mile from the start line was getting up much later than the runners who had to ride up from their homes or hotels in Houston. We barely recognized the campground when we got "home." Every campsite was filled! We knew the place would fill up for the race, but we were still surprised because very few people had arrived before we left earlier in the afternoon. It looked like all the screened rooms between the lodge and campground were full of overnight guests, too. It was quiet at night, though, and we got a decent night's sleep before the race.